So I’ve swatched, washed, pulled and prodded my Silke Tweed swatches. And guess what? I like the yarn, but I do not like how it feels knitted up to gauge. It’s almost gauze-like. This yarn seems way too thin for 23 stitches per 4 inches. I’ve mulled it over for a few days now and I’ve decided to return the yarn. I want to love this sweater, damn it, even if it doesn’t want to love me. What’s my next idea? I’m on the lookout for a tweedy wool that will get 5.5-6 spi and has a good variety of colors. 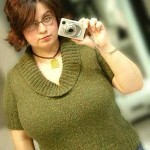 The difficult color seems to be the rusty orangey color that’s in the entire middle section of the sweater. 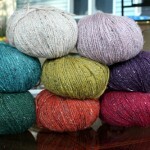 Cascade Lana D’oro is on closeout at Webs and seemed like a great choice, but no rust color. Any suggestions? I’ve been picking up Lockwood for a bit of knitting almost every night. I’m on the 3rd and 4th skeins now. I’ll spare you a pic. I’m looking for a good pattern for a nice aran for a guy. I’d prefer something that’s more cabley than it is textured stitches. I saw a Patons booklet online that looks promising but I can’t find any pics of the patterns inside the book. It’s called Weekend Retreat. Anyone know where I can buy this booklet in person? Or know of a site that posts the pics? I’ve done the requisite google search with no luck. how about rowan’s felted tweed? or did you check that out already? check out my blog, pics of the scarf! woo woo! so fuuuuuun! Maybe Rowanspun DK, if you can still find it, or Cascade 220 Tweed on a small-ish needle? Found a cruddy pic that includes the back page: Patons – http://www.everlastingshow.com/files/Patons_Weekend_Retreat.JPG …and to spare you the midi tune playing there, here are the names that site listed: Great Cables, Shades Of Gray, Zip Neck Pullover, Autumn Tones Jacket, Shadow Cable Options, Cable Panel Vest, Simple Stripes Pullover, Hooded Pullover, Relaxed Rib Jacket and Easy V-Neck and Toque. Heh – ok, time to stop being distracted… 😉 good luck! I am going to make Turtledove for my son from Jo Sharp book #2. It calls for Silk Road Aran Tweed, and its yummy. Your swatch on June 22 post looks wonderful… just plunge in and make something. Two color and Fair Isle knitting is so much fun and very addictive. Try something smaller, like a hat, so you don’t get upset if it doesn’t work out. After looking at your swatch, I don’t think you will have trouble. Good luck. Did you find the pattern yet?